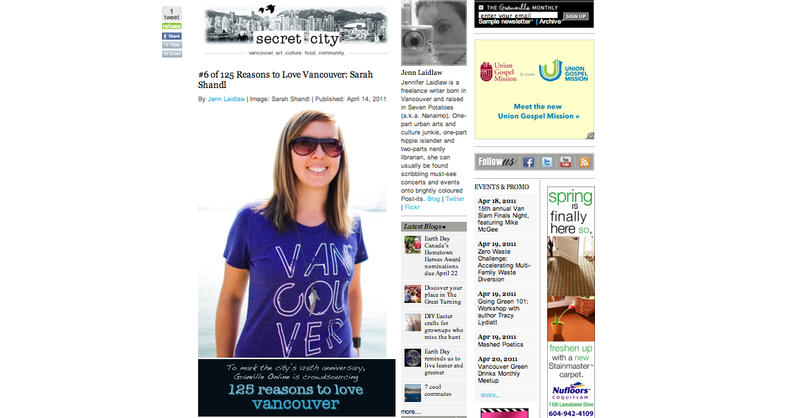 To celebrate Vancouver's 125th anniversary, Granville Online Magazine has been running "125 Reasons To Love Vancouver." Our project was an obvious fit... we are always ready to talk about all the great reasons to love Vancouver! Vancouver, we love you [the t-shirt project] creator Sarah Shandl shares her reasons for loving this beautiful city. Want to send your reasons for loving Vancouver to Granville Online? Email submissions to Granville Online Secret City blogger Jenn Laidlaw.